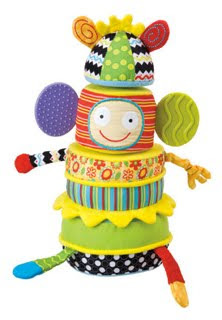 The best toys for kids with special needs holiday guide is baaa-aaack, and even better! Because this year, I went to the best experts: kids with special needs. Major toy companies sent more than 100 toys, activities, sports gear and games, both classic and new, to kids to review. Then the kids got their assistants—aka their moms—to write up reports about their experiences, the developmental boosts the items provide and, of course, how much fun they are. Whenever possible the kids' therapists checked out stuff, and I did, too. Age ranges aren't included because what works for your child's developmental stage works, although if a toy has small parts and your child likes to munch on random objects, steer clear. To see videos of kids playing with these toys, head over to Best Toys For Kids With Special Needs on YouTube. Thanks to all of the toy companies for providing toys for review, and thanks to all of the awesome kids (and their assistants) for checking them out! "Braden was very interested in this and happy with it—he liked everything about it!" says his mom, Christine, of Blessed Again. 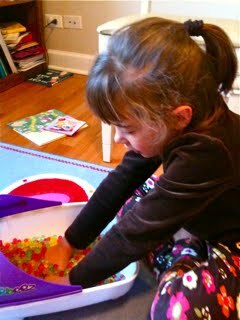 "We are working on finger activity, and it's great for his fine-motor skills. The size of the knobs helps so much. With other puzzles, he swats at them. But he manipulated the pieces very well! I loved watching his little fingers just mold themselves around the knob." Although this drill will not enable your child to fix things around the house that your husband hasn't gotten around to, it has many other charms. "Joey loved that the drill worked and often repeated 'Lefty loosey, righty tightie' as he tightened and loosened the bolts the toy came with," says his mom, Becky, of Just Another Blog. 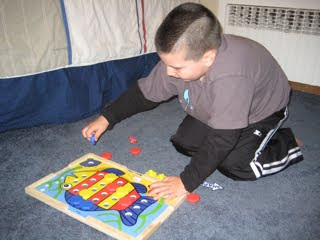 Kids who have more significant challenges with fine motor skills will need hand-over-hand help to hold the drill. "Joey had to really pay attention to what he was doing to make the tools work correctly," continues Becky. "I think this toy is also helping Joey with language skills because after he puts the cars together he sets them on the couch and opens a store with his toy cash register. He will tell me the prices of all his cars—and tell me to take mine to the register!" What it is: A sturdy, large fire engine with flashing lights that pulls a trailer with an LED sign that flashes "Road Closed." Other road signs can be cut out of the package. "From an OT standpoint, trucks like this benefit Zach's fine motor skills as he has to push buttons and attach and separate the vehicle from the trailer," says his mom, Beth. "It benefitted gross motor skills, too, as he navigated the truck through the house. We also used it with Matchbox cars and had to move them around since the road was 'closed.' In this way it also helped his play skills, which are a deficit, and helped us add new language to the repertoire. Zach loved the blinking sign the best—it's very attractive and life-like, and pretty cool. While very motivating, however, he also focused on it too much. 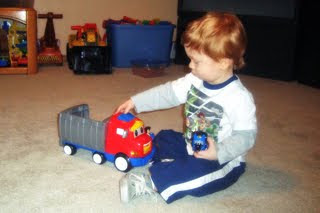 We showed the truck to one of his therapists and she thought it was great from a motor-skills standpoint—and a great way to help him with play scenarios and language." 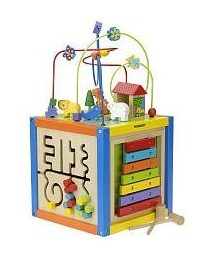 What it is: A cube with 5 sides of fun including a magnetic dry-erase board with 4 magnets, an abacus, a tracking maze and a xylophone with 2 mallets. The top has a bead maze with wooden animals and shapes. "Julia would repeatedly point to the toy and say, 'I want to play with that!' and then say 'I want to trade'—meaning she wanted me to turn the cube around so she and her sister could play with different parts of it," says her mom, Amy, of Life, Interrupted. 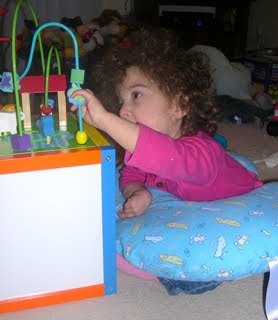 "I think it will definitely help with her grasping and reaching skills, both of which she is working on with her OT. She pushed the beads around the loop-de-loop. All the beads are chunky, and easy to grasp. She is particularly fond of the abacus and likes pushing beads to the other side. There is also a xylophone, and the cube has two wooden mallets for playing it—good for grasping and problem-solving skills. This is also a big help for her sitting skills, which we are working on with her PT. The toy keeps her attention enough so that she stops fighting me on the work of sitting because she wants to play with it! It was a great motivator—when she started falling to the side, I pulled the cube away and told her she couldn't play with it again until she pushed herself back up. After a few half-hearted 'Nos,' she pushed back up." 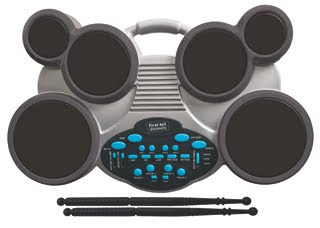 What it is: An electronic drum; kids can choose from 16 rhythm and 4 music styles and follow the lights to play. Drumsticks included. "Daniel was thrilled to do this by himself," says his mom, Melanie, of Better Than Normal. 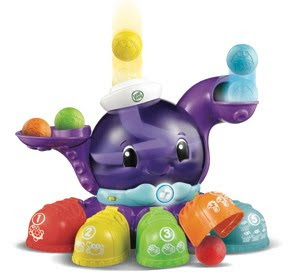 "This toy gets him to reach for the farthest drum area, and also gets him to do patterning by following the lights. And it's not too loud. Daniel's wrists bend so he couldn't hold the drumsticks the usual way but he was still able to use his hands to get the sounds, which was very cool. A friend who is an OT said she thought it was great and certainly helping him with arm movements." "Norrin has poor fine motor skills and difficulty with imaginative play. 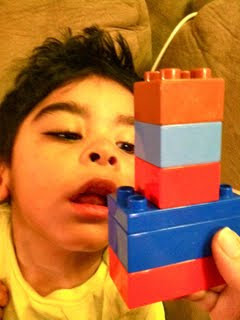 Legos have been really helpful in addressing both," says his mom, Lisa, of Autism Wonderland. "Up until recently we've used the bigger ones, afraid that the smaller pieces would be difficult for Norrin. However, he's done really well manipulating the smaller pieces in this set. It's forcing him to use his pincer grasp and improve his hand strength. He's having fun! Even though I can see it's difficult for him, he's really trying to put pieces together and take them apart. I set aside some really small pieces as he still tends to mouth small objects. 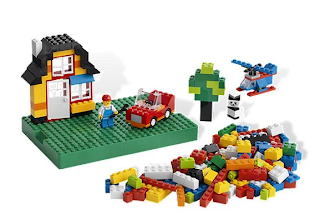 Legos have also been important for imaginative play. He likes to create 'the balloons with the house' (he enjoys the movie Up). He also builds rocket ships and planes with propellers. He really likes the extras this has—the door, the windows, wheels and propellers. They made his planes and helicopters come to life!" 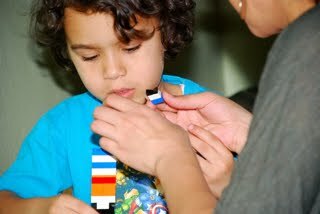 "Matthew had to use many skills to play with the Legos," says his mom Brandi of Born From My Heart. "He had to focus his limited eye sight to recognize a toy. He felt the ridges on the blocks, and seemed to enjoy the sensory input he was getting. Matthew does not generally grasp toys, but when we put these in his hand he explored the texture. He responds well to bright colors, and we used them for tracking—we'd take a Lego or a tower and put it in his field of vision, then move it slowly away in order for him to work to find it. His therapists suggested sorting by colors and playing with them against a black board or a light-colored board." "I first thought this would be a bit boring for Ava—she has a low attention span—but I was pleasantly surprised by how deeply she engaged herself in play," says her mom, Courtney. "Once she realized she could control the knife and slice the fruit, she was very proud of her consistent, repetitive success. She also enjoyed the simple, counting aspect it offered. We're just now starting on numbers, and I loved the sense of accomplishment it gave her when she was able to count the slices she 'made.' It's a great tool for food recognition, too. I appreciated the quality of this toy greatly—it seems like it's built to last and that's something very vital in this house, especially with well-liked toys!" 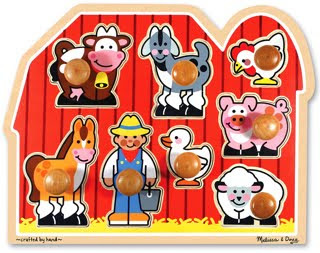 What it is: A fun first game for kids that comes with a game board, 2 dice, 5 animal movers and 4 marker bases. 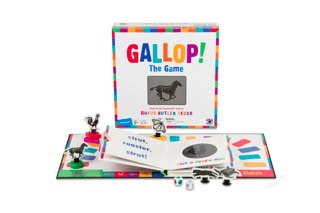 A little book is attached to the board; players open it to see which animal gets to move forward in a race to the finish line. The animals appear to move thanks to a cool graphic technology called "scanimation." "I really appreciated having Sarah use a numbered die; it helped her play the game with a little less help from Mommy!" says her mom, Jennifer, of The Three Seibel Silly Billies. "Turning the knob with just a thumb and finger was a positive challenge for her, and encouraged her to use her pincer grasp. The counting from space to space was a great benefit. She also liked getting to act out the animal at the end of the game. It got all of the family running around the house acting like a rooster, horse, butterfly, panther or sea turtle." 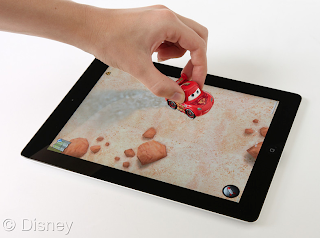 What it is: An interactive game (the "MAT" stands for Mobile Application Toys) that basically turns an iPad 2 into a playmat on which a child drives Lightning McQueen around Radiator Springs (Mater and other characters available). First, you download the free Cars 2 Appmates app from iTunes. Lightning can participate in races and do missions to earn hubcaps that kids can "spend" on accessories at stores, such as fuels that emit different colored smoke. There are cool interactive features, such as knocking over a stack of tires. Nominated to be a 2012 Toy of the Year. "Max is out of his head with excitement about this game—Lightning McQueen is like the auto sibling he never had," says his mom, Ellen, who feels weird writing about herself in the third person. "I use a clear screen protector, just to be safe and avoid scratches on the glass. Max has had a blast driving the car on the roads, crashing into things, hitting the horn. I was psyched to see how well he was able to grasp the car between his pointer and thumb, a developing fine-motor skill for him. We both thought it was cool how the car's headlights light up in the dark. Sometimes, the car doesn't register right away on the iPad screen and you have to jiggle it. Overall, this game really holds his attention. It's amazing how much his hands can do when he has Lightning McQueen as motivation." "Maya went bananas," reports her mom, Dana, of Uncommon Sense. "The cookie cutters had nice plastic ledges on the side for pressing. She liked that the shape cutters were double-sided (a star on one side and and a circle on the other). We rolled out letters and numbers for practice recognition. And she liked the penguin and turtle cutters, two animals she's familiar with from the zoo! But when she heard 'horse' and looked at the seahorse cutter she was like, 'Mom, that is not a horse.'" 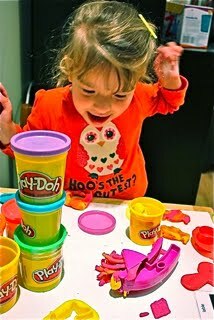 "We are always trying to find toys that encourage Maddy to play using both hands and Play-Doh is GREAT for that," says her mom, Amy. "Our OT uses it a lot in her sessions. The act of tearing the dough apart is great for her hand strength and that's something she does spontaneously, without being prompted. The duffel bag has some good two-handed tools; the press and an extruder that require two hands. I had to help her with them, because they were clunky for her to use on her own. The biggest success: the rolling pin and scissors!" What it is: Put two colors of Play-Doh in the mixer, turn the handle, and create a new color. Kids can also match objects to the ones on the included mat. A longtime devotee of Sesame Street (well, that's relative, given that he's 5), "Josh was drawn to Elmo right away and immediately began exploring the toy," says his mom, Kim. "It has a crank handle that plays music when turned, and Elmo speaks when a button is pressed. Both were good incentives for Josh to practice using a turning motion with his wrist and isolating his pointer finger, skills we are continuously working toward mastering. 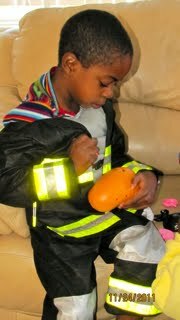 Josh can also be reluctant to explore new textures, so the Play-Doh can provide benefits in the sensory department." "Playing with this toy could benefit Carder's ability to grasp; the large handle encouraged him to grasp it properly and firmly," says his mom, Stephanie. "Carder loved to shake the truck and have it quickly rolled to him. He seemed to be very satisfied with himself whenever the toy's popping noises filled the living room!" 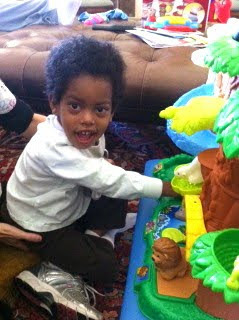 His speech therapist is working on vocabulary and clarity, so if we can get him talking about a new toy, great! We loved that Mr. 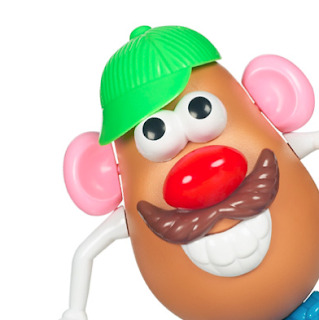 Potato Head had a mustache. Ekow really wants a mustache, he's been trying to take a milk one to school for weeks. I think the plastic mustache will be spending quite a bit of time on my son's face." "Jenna was intrigued by this puzzle—it held her attention for an extended period of time," says her mom, Jill. "The latches are quite shiny and eye-catching and all open in a different way, great for problem-solving. Some are easy for her to open, while some are more challenging and require assistance. She was determined to work at it! Some latches require her to use two hands. This is a main focus in OT. We are working on using her weaker hand to assist the stronger hand. Once the latches are undone, Jenna loves to open and close the doors. We are working on 'open' and 'close' in speech therapy. Behind each door is 1, 2, 3, 4, 5, or 6 with a different type of animal in different colors. This provides an opportunity to talk about color, count and make animal sounds." Mix 'N Max Stack Me Up by Alex Jr.
"This toy is soft and easy to play with, and Ella got good feedback from it," says her mom, Ricki. "By feeling the different pieces we were able to tell her small, big, round, top, middle and bottom. She also liked the crinkle noise the legs, arms and ears made. And it was easy for Ella to try and put the pieces together. It's now one of her fave toys!" 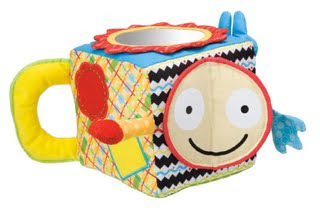 Mix 'n Max Cuddly Cube by Alex Jr.
"The baby loved this colorful, squishy cube, especially the mirror, the smiling face, and the little bunny," says her mom, of Mind Games. "She smiled at it, laughed, wanted to hold on it and chew on it. We used the Cuddly Cube as a motivational tool to encourage her to work on walking (cruising along furniture to reach the toy) in the direction of her weaker side, as well as motivation to work on reaching up for the toy to stretch her shoulders and work on extension of one finger. She discovered ways to hold the toy, especially using the toy's arms and handle to hold onto, and to transfer it from one hand to the other. We all liked that it was colorful and soft!" What it is: A way to create glowing, animated art. 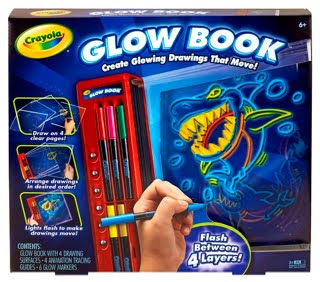 Kids can draw right on four clear, plastic panels or place them on top of a design sheet for tracing, using the included six glow markers. Then they can layer the sheets in the glowing book base to illuminate them. Panels light up individually, all at once or in cycles with the press of a button, and wipe clean with a damp cloth. Nominated to be a 2012 Toy of the Year. 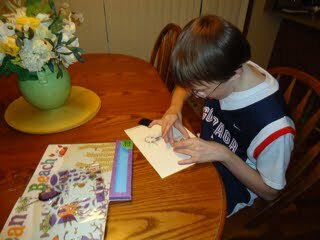 "Jonathan had to have controlled fine motor in order to trace the pictures—if he was moving all around, the page would move and mess up his picture, so he needed to remain calm and seated, a good thing!" says his mom, Sarah. "He also needed to use both hands and arms to snap the picture into the light bar, so there was good bimanual tasking. He loved that the toy lit up!" 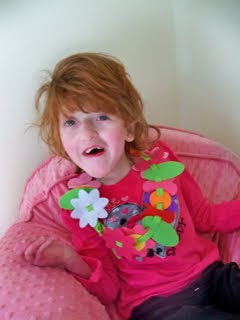 "Addison was intrigued by all of the colorful pieces," says her mom, Debbie, of Finding Normal. 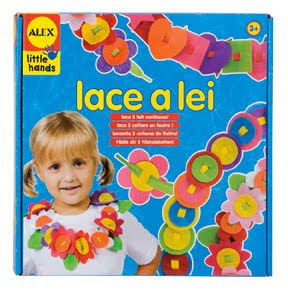 "She had to use a pincer grasp to put each felt piece on the lei, which we did hand over hand. This is a fine-motor skill she works on a lot. Her attention span is rather short, so we had to come back to it, but she liked the finished product! I liked that the box included 3 different options, two of which were gender-neutral, so her older brother was able to make a lei, too." 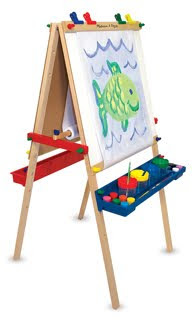 What it is: A double-sided wooden easel with chalk and dry-erase boards that measures 47" x 27" x 26". Also includes a locking paper-roll holder, a kid-safe paper cutter, four clips and a plastic tray on each side for art supplies (accessories shown not included). It has three adjustable heights, and folds up for storage. "Our occupational therapist has been recommending an easel for Nina, to inspire her to draw and better use her hands and to get her arms up—she tends to hold them down by her side," says her mom, Debbie. "This one is sturdy, and the roller keeps the paper in place. Having it was very inspiring to her—it can make a kid feel like a little Picasso. She especially enjoyed using jumbo chalk to scribble on the chalk board." "Ann said 'Find me all the bugs first!'" reports her mom, Renee, of Little Homeschool on the Prairie. "It was hard work for her hands, but she's a trooper and doesn't give up easily, and I assisted her. We took the book to her occupational therapist and she used the whole session on doing a couple of figures. She thought this was a wonderful activity for Ann; it helped her with sequencing of steps, following directions, fine-motor skills, eye-hand coordination and dexterity and attention to detail." 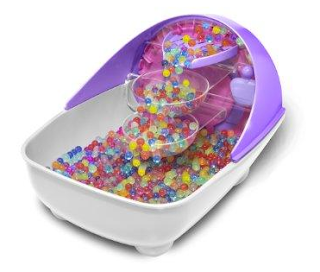 What it is: 3500 gel-like orbs in 6 colors that flow down a "waterfall"
Heads up, you may be tempted to dunk in your own feet. "Audrey seemed enamored of the name and kept repeating 'or-BEEZ!' and saying 'A treat for your feet!' which was on the box," reports her mom, Lynn, of Autism Army Mom. "Her feet are normally very sensitive, so we've always worked on giving her sensory input to reduce this (skin brushing, massage, etc.). I was surprised she was able to put her feet into the spa and keep them there, and actually seemed to enjoy the sensation. She didn't like the motor-like sound of the wheel going around. The Orbeez look very appetizing, like candy, and are tempting to eat—I had to intervene a few times. She mostly wanted to run her hands through them! They are a very cool tactile experience that is sort of unique." 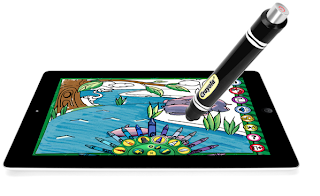 What it is: A chunky, felt-tipped pen for your iPad that works with the ColorStudio app as a marker, pen, crayon and paintbrush. 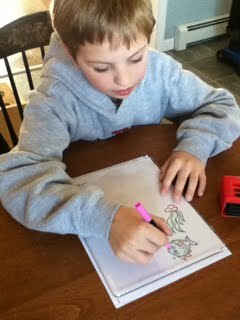 As your kid colors, music, animated characters, and visual effects bring the pages to life. 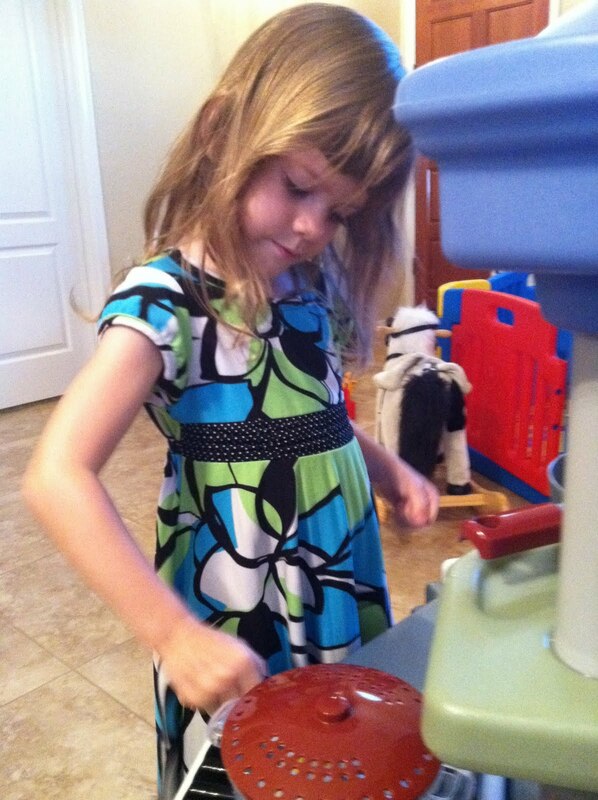 "This is an activity that Zoey has used over and over again," says her mom, Sara. "Not only does it help with skills she is currently working on, including fine-motor skills, cause and effect and learning colors, but it incorporates coloring, which she loves. The coloring pages have built-in animation, also great. It made this so much more than just a simple app for painting or drawing." "The small stamp pieces were difficult to remove from the storage board the first time we used them—I had to pry them off and hand them to Max," says Leigh-Ann. 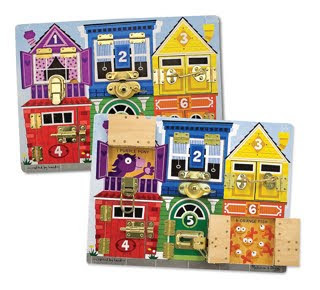 "However, once they'd been used a couple of times Max would use his pincer grip to get them off the storage board and place them on the clear block to create his own designs. He had to really look to make sure he was placing the block correctly on the ink pad and then on the paper to make a design, and worked hard to color in the lines once his design was done! He liked that he was able to create designs, and loved coloring them in." What it is: A set of 16 art boards, a stencil sheet, 2 wooden stylus sticks and 3 easel frames. 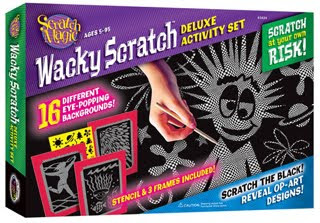 Kids draw or trace the boards with the stylus to scratch the smooth surface and reveal patterns beneath. "We are constantly working on having Stephen develop his grip on markers and crayons, and this is another good stylus for him to work on holding," says his mom, Patty, of The Life and Times of the Tiny Heine. "He had an excellent grip on the larger stylus working under my hand, but he guided the scratching, particularly when writing the letters in my name. He liked that it was really easy to write and draw, that he got to scratch off paint from a piece of paper—and that it could be considered destructive!" 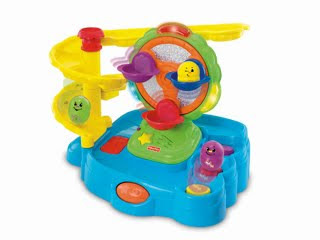 What it is: An action-packed toy with a ferris wheel that lights up and spins; figurines you can roll down a slide that back up a series of steps (and make a click-clack sound); and music and sounds. The roller activates the ferris wheel, lights and music. "We started putting the beans on the carousel part and reaching to knock the beans out of their 'seats.' It makes Brinlee focus on the movement of her hands because the carousel is constantly moving," says her mom, Erin. "After she knocks them down and they begin jumping back up the steps she laughs and smiles. The front roller is a nice touch—it encourages her to open her hands! It is easy to activate so there is no frustration or giving up because it won't do anything." 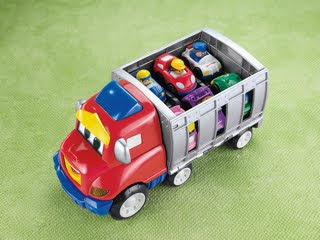 What it is: A talking truck with 50 sounds and phrases such as "Load 'em up, move 'em out" and "fender bender." The eyes, eyebrow, ears and mouth all move; the mouth lights up with sound and headlights flash. The side gate releases by pushing the truck's hood, which launches the cars. 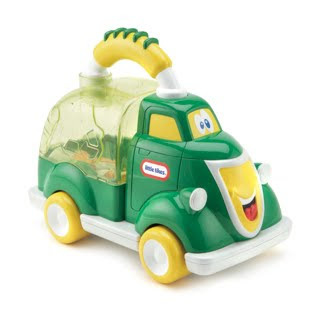 Comes with a Wheelies mini vehicle kids can load onto the truck; others sold separately. 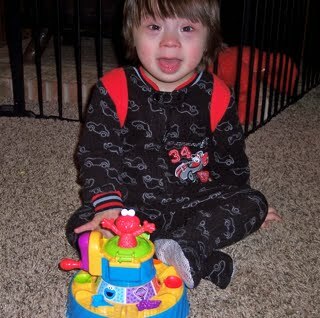 "Trevor loves cause and effect toys, so Zig is perfect for him," says his mom, Jordan, of Motherhood and Other Adventures. "He can push the top of the truck to make the cars race or shut the gate, push the truck or touch the bumper to hear the truck talk and see it light up. We're really working on wrist rotation, so I did hand-over-hand to help him turn his wrist and line up the cars properly on the tracks in the rear of the truck—there's room for 6 cars. The button to make the cars race is big and easy to push, so he could easily make the cars race. We're also working on oral-motor movements, so the fact that Zig has a moving mouth with visible tongue is great. While Trevor was playing I could ask him to stick out his tongue, just like Zig does. He has a hard time doing this, but he was able to stick his tongue out a couple of times. Trevor usually isn't a big fan of age-appropriate toys, but he really took to Zig. It was the first thing he went for when he woke up in the morning!" 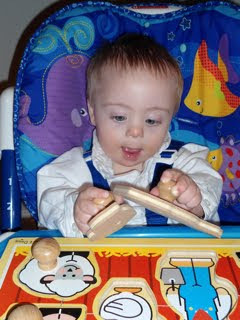 "Paolo immediately liked the pictures on the blocks and spent time intently looking at those," says his mom, Heidi. "He got very excited when I showed him how they could make sounds. In therapy and at home, we have been working with stacking and he knew right away he could do that. The size and shape of the blocks were easy for him to pick up and put them in the tray by himself. Both of us liked the fact that it was only two blocks; because there weren't so many pieces, he was really able to focus and not get overwhelmed. 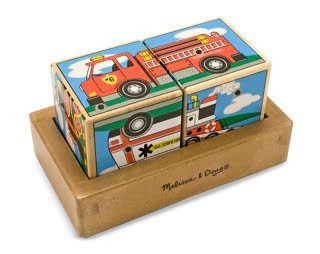 Paolo wasn't able to match the pictures on his own, but there is so much more you can do with this than matching and we love a toy that can grow with our child! We did the matching together—when he put in one block I would go hand over hand with him to pick up the other and show him how to rotate and match the pictures, and he loved when it made a sound. Of course, the smartypants figured that if he repeatedly hit the toy it continued to make the sound too! This toy was a winner." 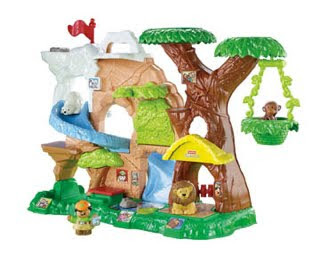 What it is: An interactive playset; place the lion, polar bear, gorilla on a red paw pad to hear its name then press it again to hear the sound it makes. There's a peek-a-boo door, slide and teeter-totter to explore and other sounds including a ticket booth where Zookeeper Zack makes announcements. Also included: A Discovering ZooTalkers DVD, plus stickers for decoration. 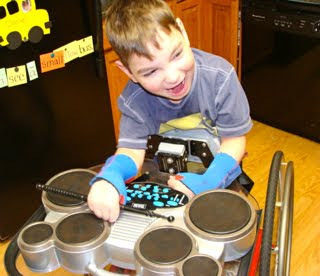 "Abe benefitted from this by the quick response of sounds and music when he pushed a button," says his mom, Emily, of Soli Deo Gloria. 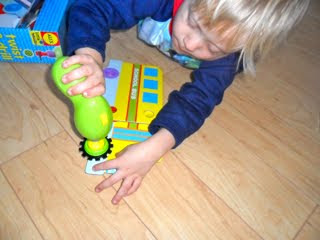 "He worked so hard to reach and grasp the various animals and press the buttons on the toys that made noise. He particularly liked to push the polar bear down the slide again and again! His therapist was here when the toy arrived and she loved it for Abe. It allowed him to work on sitting, reaching and grasping, cause and effect and head control. She also worked on different places to place the toy. We moved him to the floor and the toy to the bench, which worked well for him. I definitely think she will want to use this more with him as he loved it! His smile at the end of the session said it all." 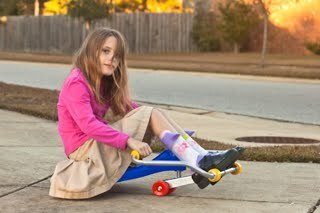 What it is: A self-propelled scooter with a molded seat that can be used indoors and outdoors on any hard, smooth surface; it's popular in schools, day-care centers, physical therapy clinics, roller rinks and more. Has a "rams-horn" design handlebars and bumper wheels to protect surfaces when riding indoors. Designed for kids ages 4 to 12, with a weight limit of 250 pounds; made in the USA. "Sarah Kate has always had a desire to do things like ride a bike, but struggled with being able to propel herself due to the weakness caused by spasticity in her legs," says her mom, Andi, of Bringing The Sunshine. "Over the years, her upper-body strength developed to compensate for the weakness in her lower body. The Roller Racer is propelled by holding onto the handlebars and swinging from side to side, using the upper body only, so she was strong enough to use it and wasn't disappointed, as she has been in the past with other toys. There aren't too many core-trunk strengthening exercises that Katie enjoys (me either, for that matter, LOL! ), and the Roller Racer's chief strength is in its use of the core. Her physical therapist observed her riding it and agreed. Sarah Kate has a tendency to tense up her arms and shoulders when she feels off balance. I noticed that unless I prompted her to relax, she unintentionally limited the range of motion in her arms, which limited her ability to move the toy. With practice, she was able to improve! She really enjoyed the feeling of being able to zoom down the sidewalk. For a kid who's never been able to feel the wind in her hair running across the yard, a toy that gives her that feeling is a good thing." What it is: A mini version of what you use at the supermarket, only without kids in it begging you to get them cookies. Toys not included. 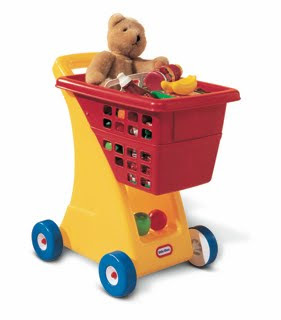 Max had this exact toy as a tot; our PT recommended weighing it down with cans when he was learning to walk, and he'd cruise around the house, on a perennial trip to the grocery store. Like him, Daniel has used it for learning to walk and balance. "It's fairly stable, with a wide base, so he never seemed to get off balance," says his mom, Kim. "He was able to push it easily. I loved that it was a good height. He's on the smaller side for his age, but he's still too tall for the traditional baby/toddler walker toys. He had to bend over to use them which didn't do any good, since he already has balance and posture challenges. We used it to play store and put some items up high and down low, then had him place them in the cart—a good way to work in PT activities!" 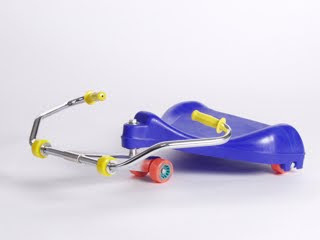 What it is: An aluminum scooter for kids who are a max height of 110 cm and weight of 44 pounds. 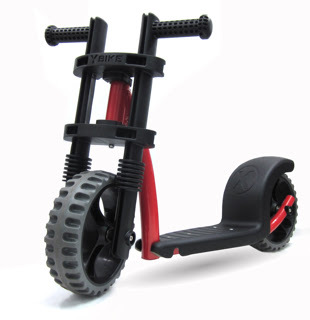 It has large rubber wheels and a low center of gravity for easy balance and control. 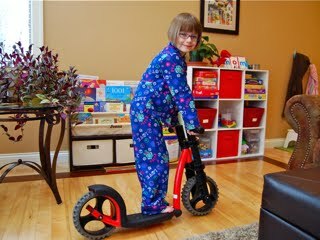 "Jenna has wanted a scooter for at least a year and has asked for one repeatedly," says her mom, Dawn, of Psych Mamma. "Given her challenges with balance and motor coordination, we were afraid this would be a recipe for disaster—or at least an ER visit. We loved this one because it has wider wheels that give it a little more stability. For the first day, she would only sit on it and scoot around. By the second day, she started cautiously scooting with one foot on and one foot off and by the end of that day, she was going further and gaining confidence and balance skills! This is HUGE for her—it takes major coordination and engages her core strength and balance, which we've been working on a lot this past year. There's no doubt this will help with both, along with motor planning and coordinating. Oh, and she loved that it was RED!" 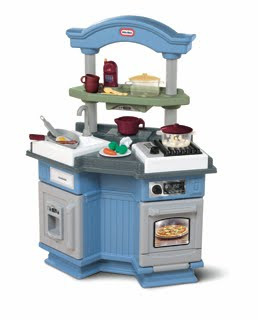 What it is: A play kitchen with "pop" and "sizzle" sounds, fridge and oven doors to open and close, cabinets, and a stove that glows when the knob clicks on. 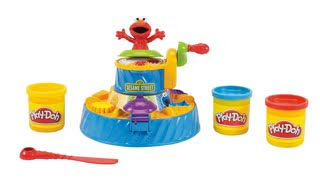 Comes with dozens of pieces including pots, pans, and play food. Reviewed by: Hannah, 4, who has cerebral palsy. 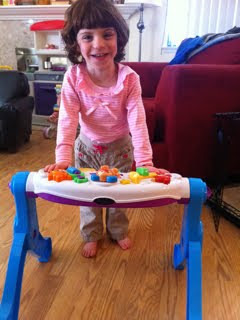 "This toy is great for standing while playing," says her mom, Stephanie. "Hannah could stay up for 10 minutes at a time, and I used her eStem unit to stimulate her muscles while she played. I like how the kitchen has some features on the left and others on the right, which encourages movement. She had to shift her weight back and forth. For OT, she had to use two hands to work and cary some items. This can also teach Hannah about table manners and setting the table, great social and life skills. It comes with so many accessories, very neat. She liked pretending to do what Mommy does. Hannah loved the noise that the kitchen makes, but if you don't remove the popcorn or frying pan, it just keeps going! Another benefit is that the colors are gender neutral. A lot of play kitchens come in girly colors but these are neutral, so it would be a good gift for a girl or boy." 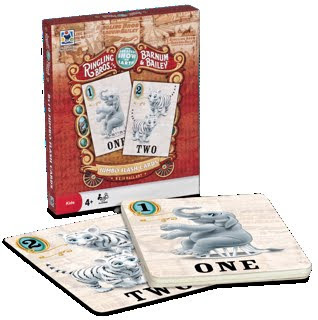 What it is: A set of oversize flash cards (8" x 10") with artwork of animals to help teach kids numbers one to 25. "We've never had flash cards this large before, and Maddox was interested in them and the bright colors," says his mom, Jillian. "We are working on recognition of numbers 1 to 10, counting on fingers and understanding what each number value represents. I showed these cards to him, explained the number of objects on the card, showed him how many fingers each object represented and used his fingers. He seems to do better with toys that talk or give audible feedback, but he's so close to recognizing numbers and their values and we'll definitely keep trying to use these with him. They are very little-kid friendly—Maddox has never been more interested in flash cards than he was in these." 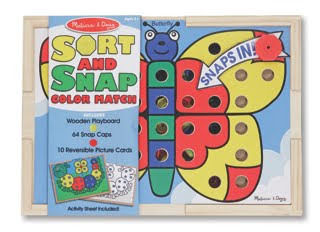 What it is: A set of color-matching and creative activity boards; kids place snap caps into holes to hold picture cards in place. One side has color, for matching; the other side has black and white, so kids can create their own patterns. "This was a great toy for my son! It helped with fine motor skills as well as matching colors, and we also practiced counting with it," says his mom, Barbara. It was a little hard for him, so he did a little at a time. Matthew liked all of the different designs, and pulling the pieces out of the card." 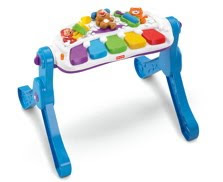 What it is: A musical toy that connects to the TV that has 50-plus songs and tunes; kids can have fun with instrument sounds and learn about counting, shapes, colors, animals and more. "Ayla was excited to bang on the piano keys, and danced to the music she made," says her mom, Laura. 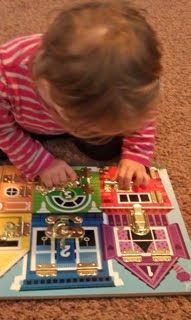 "She is working on identifying colors and shapes, so this toy gave her a fun and musical way of working on these goals. 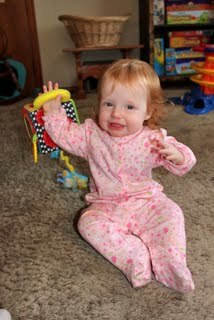 I liked that it encouraged her to stand and play at the same time, good for gross- and fine-motor skills. Ayla started sliding this on our wood floor and using it as a walker. It's better to have carpeting beneath it to stabilize it if your child has gross motor issues." 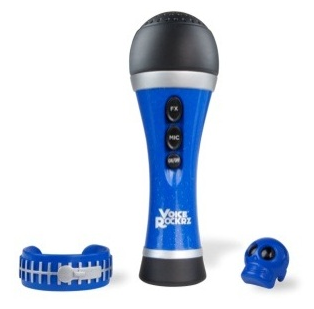 What it is: A microphone that has three different voice effects (Hi-Note, Echo-Tastic and Robot-Riffic); tap the included accessories onto the spot on the microphone to change the voice. Also has the roar of a crowd and drumroll sound effects. Kids can plug in an mp3 player and sing along. "Practicing words and sentences with a microphone is right up my little rock star's alley!" says his mom, Cathy. "He likes that he can hear his own voice, with different effects. His favorite was the robot voice, which he used almost exclusively. The cheering sound is popular—he loves when someone cheers for him! Since the normal low volume is still a bit loud for him, I put tape over the speaker, which helped. He's been making up songs to sing about things he is doing. This is a big step, since he is just starting to speak in sentences. For him to come up with a song on his own is wonderful. We have been really pleased with the creativity the Voice Rockrz has inspired." 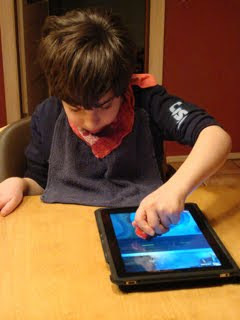 "Playing this game gave Philip the opportunity to practice taking turns, following rules, interacting with other players (my husband and me) and working with them to complete the task at hand," says his mom, Kristine. "He also had to connect concepts to a situation, something his class is working on. At one point, the challenge was to wrap a surprise gift, and he had to do it with a dragon, a carrot and a sombrero! He struggled momentarily—kids on the spectrum are often literal thinkers. But once we spoke about how stories can be silly, he came up with a great idea: He decided the dragon was trying to spoil the surprise by making lots of noise. To quiet the dragon, he stuffed a carrot in its mouth, then he hid the gift under the sombrero!" 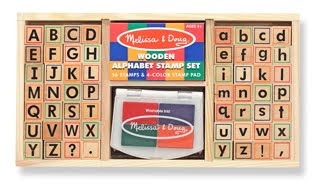 What it is: A stamp set that includes 56 letters (upper and lower case), punctuation marks and a four-color stamp pad in a wooden storage tray. "My students' handwriting is not very good, and the stamps allowed them to do things that would have normally frustrated them," says Jodie. 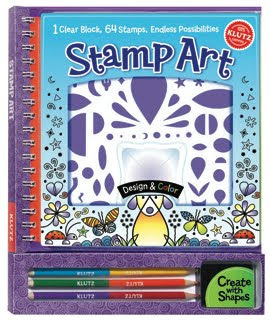 "They were able to create sentences and then Thanksgiving cards with the stamps. One student used the stamps to match upper- and lower-case letters in a way that we have not done before. I really enjoyed the stamps as I could see what the students could do when presented with something new and without instruction." 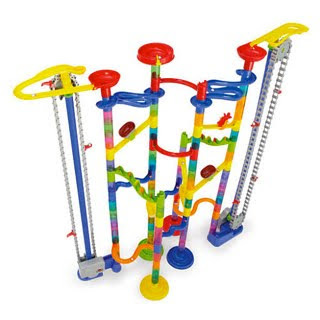 What it is: A track that comes with 20 track pieces, 50 connectors, 20 marbles, 9 rollers and 2 paddles that spin. "Happily, there is no one way to put this together, which allowed Nick to create his own design," says his mom, Sharon, an occupational therapist. "We talked about angles and planes and proplusion, etc. Then we used the enclosed design to create the picture of the marble tower that was on the front of the box. And oh my God, the heavens cried with happiness that we could create what was advertised on that box! He particularly liked the swirly and flapping tracks. I would recommend buying larger glass marbles, the ones that come with the toy are small and plastic. 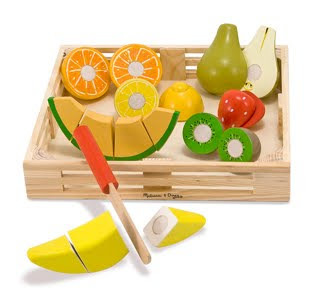 This toy required Nick to focus on a structured task for a prolonged period of time. He was able to bring creations from his mind to life and have tangible achievements, always so important. As an OT and a mom, I love this for kids on the autism spectrum. It allows for independent and peer play, removing barriers such as language." What it is: A toy that helps teach colors and numbers; drop in the ball and lift one of the shoes (numbered one to five) to find it. The lifted shoe says the number out loud. Kids can also press a button to play music. "Ethan likes 'peek-a-boo,' so looking for the balls appealed to him," says his mom, Sarah. "And the toy talks, so that kept him interested as well. I can see this really helping with identifying colors, which has been hit or miss for him, helping a child learn to count to five, and helping with eye-hand coordination." "What surprised me most about the process of assembling the robot, which took a good 15 to 20 minutes, was that Noah—who normally doesn't sit down for any period of time (seriously, the boy watches television standing up! )—sat at the table the entire time with my husband, watching the robot come together," says Sunday, of Extreme Parenthood. "Sam named him Roberto, which if memory serves is the name of the robot from Dora the Explorer. My boys, always sticklers for consistent names! Once Roberto was finally assembled, Noah got down to business putting on stickers and giving him a few splashes of color. After he was done decorating him, he took him into the bedroom and curled up to watch some Dora. 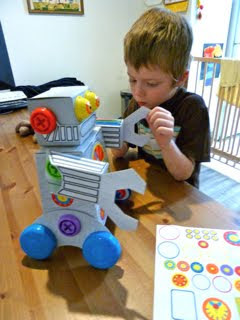 I would recommend this robot to kids with aspergers or high-functioning autism, for problem-solving skills. The decorating and coloring are perfect for kids of all ages and stages." 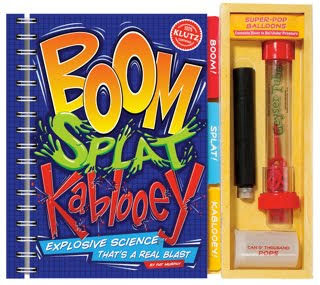 What it is: A book of simple science experiments using stuff from your kitchen that comes with 4 balloons, a Geyser Tube, depth charge and and a Can O' Pops. 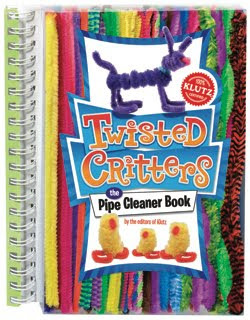 It's geared towards kids over 8 (and meant to be done with adult supervision so they don't blow up your lovely kitchen). "Caleb loves to learn and this book is full of information and great experiments. He actually shouted 'I love this, this is so fun!'" says his mom, Emily. "One experiment we did was mixing baking soda and vinegar in a little film-like canister, then seeing what would happen—it builds up pressure and the lid pops off. There are also balloon experiments where you try different techniques to pop them. The skills he is working on are social ones, and Caleb explained all of the experiments to his dad and worked with him on figuring them out. Really, it is a good book for my chid with aspergers because these kids tend to have things that interest them and they want to know everything about that interest. My son loves science, so he enjoyed this!" Oh my goodness! Great guide and some I never knew of. I have two boys that I am shopping for and needed ideas! I always look forward to seeing what will be on your list. This is a great one - I love the added bonus of the kid & parent reviews. Very nice guide, we have posted to our FB page for our customers. Thank you so much Ellen for including the Trouble Brothers in this year's toy guide. Noah especially loved his Build and Roll Robot and as soon as I find his head he'll be playing with him when he gets home from school. What a great list! We have a couple of these and would like to get some of the others that I've never even heard of. Its always great to get feedback from other special needs families. Thanks! This list is so great! Thanks for the detailed explanations about why each toy is helpful for specific special needs. This makes your post a helpful guide AND a learning tool for people who work with, or have, kiddos with special needs. 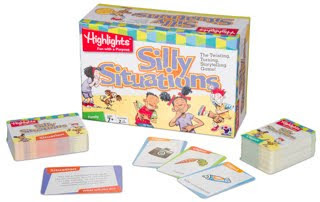 Thanks, Ellen, for letting Stephen and I help with your review - we are still having fun with the Wacky Scratch set! 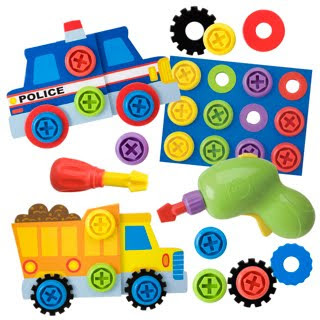 I loved reading about all of the other toys (and I'm considering the Cars AppMATe for a birthday gift for him, now!). Thanks again, it was fun! What a great guide - will definitely share! Wow--Toys R Us should publish this and stock all of your recommendations! great guide! Some of the toys we already own. glad to see they made the list. makes me feel good. Thanks for the great reviews and suggestions. This is incredible!! I'm sharing it everywhere I can! Loved being included and found some new ones to buy! 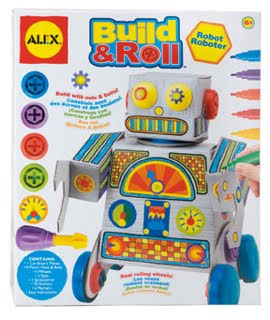 I especially love the ones for the iPad and the build a robot---that's so neat!! Thanks again!!!! Again I am thrilled with the products available to all of you! Obviously they are quite different in quality and availability from what we had 50 years ago! One everlasting toy we had was "Missa Tater Head" which all of us enjoyed. I love the pictures of the precious children playing and learning. Thanks Ellen! Love this list! I was just trying to find something for my little guy! Thank you so much for including Paolo in your holiday guide! 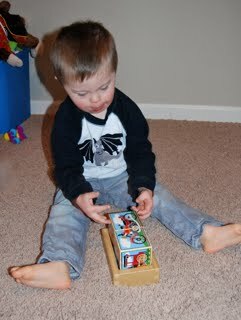 He is still enjoying his Melissa and Doug sound blocks! I also got some great ideas for Christmas too! Good job, really enjoyed the guide! Holy cow, this is beyond AMAZING. Will tweet this out and FB it. Really, Ellen, the love and work involved here. I think of so many magazines that would love this. Can't wait to share this! thank you! cool choices! Another fun gift is the TickleMe Plant Greenhouse. In it you can grow a real house plant that suddenly closes its leaves when Tickled! I love your Blog! these are wonderful toys for special needs kids. I wish that I had the funds to carry these toys on my online store. I have just recently decided to open my own store for special needs kids, after so much frustration in trying to find good toys that didn't cost a fortune, would be fun and could be use for in home therapy. 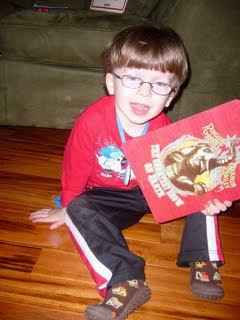 Most of the toys that I carry have been recommended by my son's many speech therapist and many books that I have read. If you have a minute to go to www.momospecialtoys.com and give me suggestion I would really appreciate. I have no idea why I am so late to see this great site! Love how you set it up with your reviewers. I think it makes the world of differences. There are great things for every child in this list! Thanks for sharing all these ideas!! 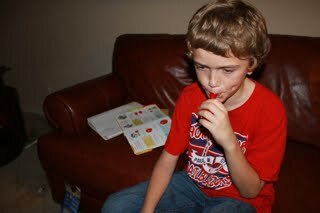 We didn't yet know our son had Autism this past Christmas & although he'd had already been in E.I. with an IFSP eval that showed him as having a whole bevy of delays, we just still didn't fully understand it yet. We've been bit by bit adding more toys & such to help him both with his happiness & his development. I'm bookmarking this blog post for the future. We have some of these items, but I can see more that will definitely be on my wish list now. I realize how old this article is, but if someone sees this comment, thatd be awesome. So, the lego bricks that are bigger than the traditional size seem awesome for younger kids, but are kinda clearly designed for the younger kids. 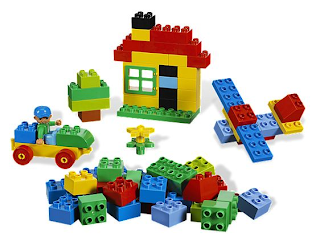 I wonder if anyone knows of anything for a teen who just has trouble with the small size of the usual Lego bricks, but would like to do cooler more teen age or adult targeted Lego stuff?